Lionhead rabbits are relatively new in the United States, with breeding programs starting around 2000. These little fur balls have dense, wooly coats and come in several colors including Japanese, magpie, seal point and certain solids. Their history and lineage is a bit of a mystery, and even today these guys are regularly crossbred with other types of rabbits. These guys are on the smaller side of the scale, reaching only about 4 pounds -- sometimes less. Being so small and fluffy, the lionhead is favored as a pocket pet. Lionheads are revered for their gentle, inquisitive dispositions and willingness to play, although they can be a bit on the skittish side. Handling from a young age helps these fluff balls gain the trust of humans and increases their friendliness. More than a little speculation surrounds the origins of the lionhead breed, although a general consensus is that the first sightings of a small mane were visible in a litter of Swiss fox and Belgian dwarf crossbred bunnies. Continual crossbreeding in Europe after this litter with other wooly rabbits resulted in the European lionhead rabbit of today. In 2000, lionheads were the concentration of breeding programs in the United States which resulted in today's small American version. Their namesake is their mane, similar and full like that of a male lion. Not all manes are the same; some lionheads have a single mane, a double or even no mane. Double manes are much thicker and have a long, wool skirt around their haunches. Single manes are only around the face and head and resemble more of a sunflower. The double-maned bunnies often have too much wool with their mane extending onto their face. Single-maned bunnies have smaller skirts. 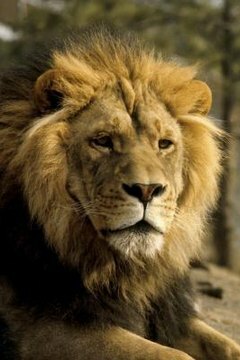 Many lionheads are a mix between both to create the ideal mane. Their thick, dense wool requires more care than most other rabbits, although they're not as labor-intensive as long-haired Angoras or similar breeds. Regular grooming and checking for knots in their wool can help keep them safe, comfortable and looking their best. Run a cat brush through their wool a couple of times a week and use a mat breaker or other tool to break up mats before they get too large. They do shed, and grooming is more important during shedding time. Wool-block is a potential problem due to their long wool. Feeding is the same as for other rabbits and their diet should include an unlimited supply of fresh timothy hay, low-protein pellets and fresh veggies. Dried papaya may help prevent wool block and is a tasty, healthy treat.